Valentine’s Day is associated with flowers and chocolates filled with sugar and fat—certainly not a recipe for a healthy heart. Medical research shows that a diet high in refined sweeteners and fats can cause hardening of the arteries, which can lead to heart-related illnesses. What can be better than saying “I love you” by preparing a heart-healthy meal for your loved ones? This meal will warm his/her heart in more than one way. Here is a partial list of heart-friendly foods and not-so-friendly foods, followed by two health-promoting recipes. Here are two recipes. Upma, a traditional South Indian breakfast dish, is made with cream of wheat or cream of rice, vegetables and cashews. The other is a chutney (a spicy condiment) made with dried goji berries and cranberries. Both dishes are low in fat and sweeteners. Both are vegan and gluten-free. Heat the water in a sauce pot until it starts boiling. Add the salt and keep the water very hot over a low heat. In a 10” to 13” stainless steel skillet or an iron pan, toast the cashews while stirring constantly. As the nuts start to turn color, transfer them to a bowl and set aside. (Roasted cashews do not have to be toasted.) Wipe off the skillet and add the cream of rice. Toast the cream of rice, stirring constantly. When the cereal starts to change color (3-5 minutes), transfer it to a platter and set aside. Place the oil (or vegan spread) in the same pan and add mustard seeds. When the seeds sizzle and spatter, add the onions and cook for 2-3 minutes, stirring all the time. When the onion becomes limp, add the optional jalapeno and stir fry for a minute. Then, add the cream of rice and continue to sauté the mixture for several minutes while adding the carrots, peas and nuts. When the cereal is well mixed with vegetables and nuts, slowly and carefully add the water with one hand. Careful: it will splash. Using the other hand, stir the mixture with a wooden spoon. Blend the mixture well, breaking lumps and spreading it out. Turn the heat low and continue to cook until all of the water is absorbed. Sprinkle on the lemon juice. Add the optional cilantro leaves. Cover the pan and allow the upma to sit for 10 to 15 minutes. Next, transfer the upma mound onto a serving plate and pat it down gently, using your palm or a spatula to spread it out into a 8” to 9” circle that is about 1” thick. If you like, form the mound into a heart shape as shown in the photo. The circle or heart shape can be cut into individual servings. Serve upma with goji berry and cranberry chutney (recipe to follow). I never grew up with cranberries in India. But in the US cranberries are an essential ingredient, especially for a Thanksgiving dinner. For these holidays, I decided to jazz up the cranberry sauce by creating a cranberry chutney with spices. 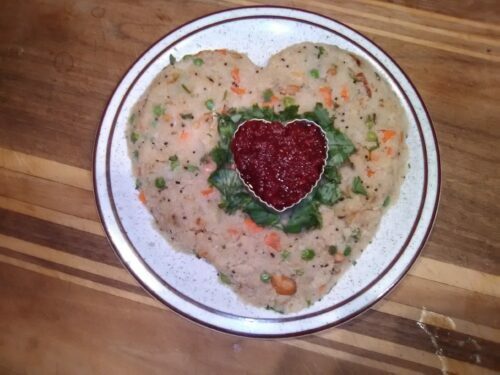 However, when I wanted to duplicate this red chutney for a valentine dinner in February, there were no cranberries available in the market. So I used dehydrated cranberries and goji berries to make the chutney. Both goji berries and cranberries are excellent sources of vitamin C and antioxidants- nutrients that can protect us against chronic diseases and prevent growth of cancerous cells. In addition, goji berries can increase good cholesterol (HDL) in our blood and cranberries can enhance digestion. Cover dried berries with hot water in a bowl and soak them for 30 minutes to an hour. Next, place all of the ingredients into a jar of a food processor including most of the water the berries were soaked in (reserving some water). Process mixture into a puree, adding more of the reserved water, if needed. Serve one or two tablespoons per person with Upma or any grain dish. If refrigerated, leftover chutney can keep for a week.